Andersen, Hans Christian. “The Mermaid.” The Mermaid and Other Fairy Tales by Hans Christian Andersen. Illus. Maxwell Armfield. Trans. Mrs. Edgar Lucas. Ed. F. D. Tilney. New York: E. P. Dutton & Company, 1910. 9-35. Mermaids have been a part of popular culture dating back to their date of origin in 1000 BC in Assyria. For centuries they have been interpreted in many different mediums (including folklore and film) and portrayed in different societal roles. This exhibit examines by example the way in which their roles and moral representation in pop culture have morphed through the ages. Specifically this presentation focuses on Hans Christian Andersen’s short story, The Mermaid (1837), and Disney’s film, The Little Mermaid (1989), to demonstrate how evolving time and an ever-changing societal moral code have defined these two distinct interpretations of mermaids. Hans Christian Andersen (1805-1875) was knowledgeable on mermaids as they appeared frequently in popular culture during the period in which he lived. Andersen used elements of traditional mermaid characteristics, but still created his own personal version that is original in its story. Since the time of early mythology, fantastical creatures of the sea have had a place in the oral traditions of folklore. Merfolk exist in stories from all the world over, and are represented in a multitude of forms. Their top halves are human-like, while their bottom halves are fish-like. This combination of sea and land forms appears time and time again in real life accounts and in fictional tales of mermaids in contact with humans. Living in the ocean, the merfolk may rest on the waves or a rock in the water and be often disguised by the water or as a fish. In Andersen’s story, the Mermaid holds a fascination with humans. She begs her grandmother and older sisters for information about the wildlife, the greenery, and the scents. From the time that she was young, she was desperate to find out as much as she could. When she turned the age of fifteen, she was allowed to approach the surface of the water to view the world from above the waves. Her adoration of mankind grew until she could no longer sustain the thought of being a mermaid. Despite her Grandmother’s clear warning to steer away from thoughts of life above water, and her insistence that she honour her commitments as a mermaid, the Mermaid pays no heed and determines the land is where she wishes to be. She must be loved by the Prince as though she is a family member, yet she dares to risk everything to take advantage of the opportunity to win his love and affection. She approaches the Sea Witch to help her in reaching her goal. The natural ability to entrance men with her loveliness and siren-like voice is a key characteristic of a mermaid. With her enchanting voice, she sings to fishermen. Traditionally, mermaids offered these men safe harbour from harm. 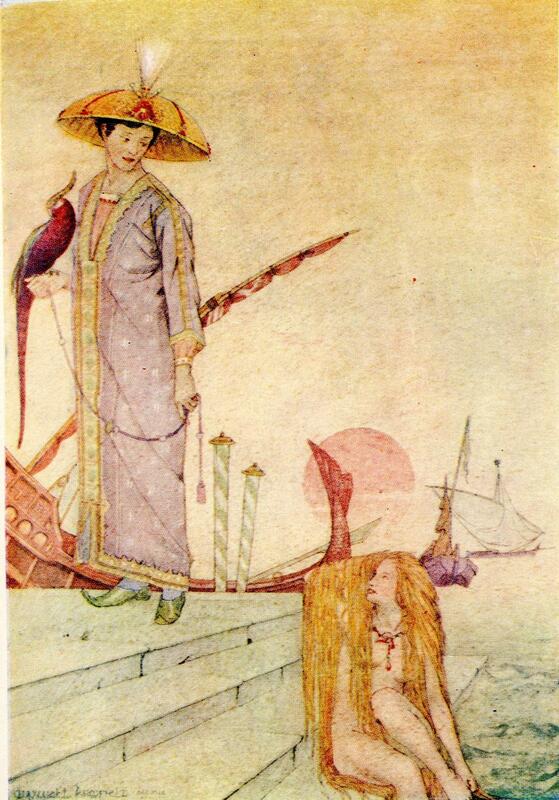 Andersen’s mermaids have beautiful voices, which he describes as being clearer than any mortal voice (Andersen). During storms on the sea, they sing to the fisherman, bidding them no ill will. It is this lovely voice which the Mermaid sacrifices in order to be in touch with the Prince to discover love and happiness on land. Essential to her character, her voice defined one of the key features of mermaids and their purpose to living in the sea. On land, her ability to prove her love and dedication to the Prince relied only on her physical beauty. That which made her unique was no longer an option for her, and the Mermaid was punished for her unfortunate lack of understanding of reality and the human world. Without her voice, she is able neither to convince the Prince of how she saved his life, nor seduce him with her voice. The Sea Witch has bargained with the Mermaid for her sexuality and it has not paid off for the Mermaid. In some versions of stories involving merfolk, the merfolk make actual contact with human life. These tales have been passed on through the ages, allowing mermaids to maintain a certain reputation of both trickery and safety. In some stories, the mermaids are the thought to have carried men out to sea and to not have allowed them back (Waugh). In others, she is merely a flash on the ocean, and a good story at the local pub as fisherman regale one another with tall tales. Andersen’s Mermaid has the opportunity to have the Prince perish at her hand, but she chooses instead to release herself from the promise of love. There are many instances of sexual undertones in Andersen’s story. Although the Mermaid has made many sacrifices, she is not emotionally mature enough to engage in a relationship with the Prince. This story is meant to be a warning to girls to wait for what will naturally come to them, as Andersen intended. The Mermaid’s fascination with mankind, and the initial motivation to approach the Sea Witch, in the end undid the Mermaid and her contact with her family. 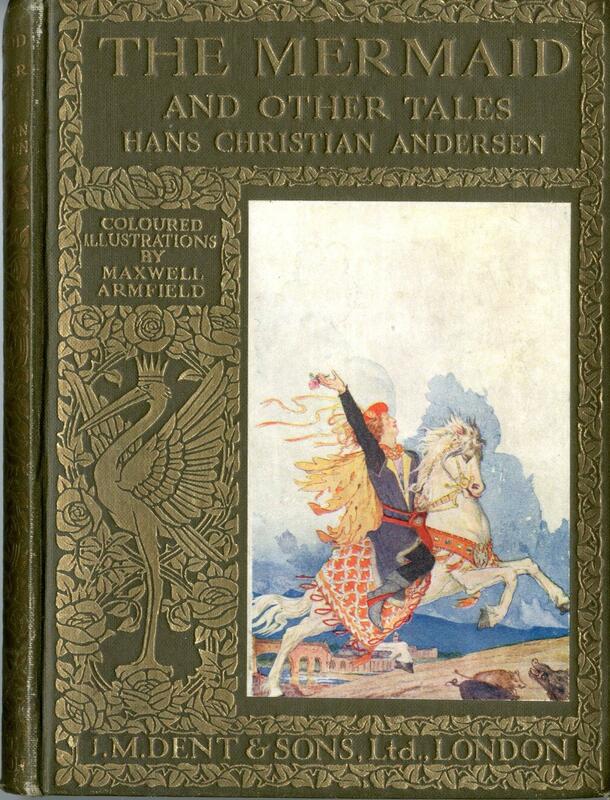 Maxwell Armfield (1881-1972), a British artist, illustrated the collection of Andersen’s stories. The book is bound and decorated intricately with gold leaf. It features an illustration from one of Andersen’s stories, and is enticing to the viewer. One is able to see keen detail in Armfield’s work inside the book, especially. The graphics are printed in colour, and display a wide range of shades and tones. Armfield has exercised extreme care in imagining life for merfolk. The Mermaid’s long, flowing hair masks her body partially and adds to the allure of the mermaid. The clothing of the Prince, and the structure of the ships, are intricately illustrated. They demonstrate the grandeur and exoticism of human life to which the Mermaid is attracted. "A big three-masted ship lay close by." In the time period between the first publication of Hans Christian Andersen’s The Mermaid in 1873 and Disney’s interpretation, The Little Mermaid in 1989, much has changed in the way of moral structure between the two stories. At face value, the moral seems to be that with great sacrifice and change comes great reward. The issue is whether that moral is even universally realistic. And this begs the question of whether Andersen’s interpretation has a deeper meaning. In Andersen’s version, the Mermaid experiences monumental sacrifice before she is rewarded. The Mermaid rescues the Prince from drowning and immediately falls in love with him. The unfortunate issue in this scenario, however, is that the human Prince could never fall in love with a woman of the sea. Being infatuated with the Prince, the Mermaid desperately tries to change herself to accommodate and gain the Prince’s affection. The Mermaid sacrifices her impeccable singing voice in exchange for a potion to convert her mermaid tail into a pair of legs. Although it brings the Mermaid excruciating pain at every step, she sets forth to find the Prince. While he is attracted to the Mermaid it is not enough to terminate his arranged marriage and despite the Mermaid having sacrificed the fundamental aspects of herself is to entice the Prince, it is inevitably not enough. It is at this point in the story that the mermaid suffers a broken heart. Through all the trouble and turmoil through which she has gone in order experience freedom and love, it is clear that she made her sacrifices in vain. She can’t bring herself to kill the Prince and return to being a mermaid, so she instead kills herself, ending her life after rejection. In order for the Mermaid to be rewarded for her personal sacrifices, she must first live through the pain and torment, and also be forced to make impactful decisions. Only after she has experienced all that she had in her life under the guide of humanity is she given the opportunity to return to the world as sea foam in the afterlife. She becomes a daughter of the air and by performing good deeds, she will one day gain access into the Kingdom of God. At first look, it seems that Andersen leaves the reader with a similar moral to that which Disney presents. By sacrificing the key aspects of yourself to conform to society’s picturesque standards, you will eventually be rewarded with acceptance. The Mermaid went through extreme pain and upheaval to gain this acceptance and eventually it paid off—but only in the afterlife. It is this key detail of the reward in afterlife that makes Andersen’s moral appear deeper than originally interpreted. Upon closer analysis, Andersen’s imparted moral is in fact suggesting the opposite message to that of Disney’s film version. The Mermaid is rewarded for her sacrifice but not during her lifetime. She may find fulfillment only in the afterlife. This underlying meaning comments on the fact that not in reality is such an accepted transformation possible. While eventually the Mermaid was rewarded, she does not find happiness as a result of her actions during her own life in the real world. Andersen’s moral can be interpreted as one which is darker and more realistic. In reality, despite how great of a sacrifice or outward change is made, one can never fundamentally change the essence of who one is, and can therefore never find true acceptance and happiness in the altered form. Disney’s version interprets Andersen’s moral at face value, however. To begin with, the protagonist Ariel has to go through no great lengths to gain the love and acceptance of the Prince, unlike Andersen’s mermaid. While Ariel is forced to change to accommodate the love of the rescued Prince, her mild-by-comparison sacrifice pays off. In this interpretation, the protagonist also makes a deal with a sea witch, Ursula, sacrificing her beautiful singing voice to gain human legs, though without any physical pain. Ursula tries to gain the Prince’s affection herself, not because of love, but to gain power of the sea. She attempts to trick the Prince out of marrying Ariel. Ursula’s trickery is short lived and although there is much chaos and excitement, no real suffering is experienced by Ariel. Ursula is eventually killed, and Ariel and the Prince live happily ever after. In the end, Ariel is granted the human life that she wished for from the start without having to experience the traumatic pain, rejection, and even death, that Andersen’s mermaid underwent. The significant changes Ariel makes to be accepted by the Prince cause her to be successful, and she is rewarded with human love and life. Stereotypically, Disney’s messages are known for being positive and seemingly morally right, thus making Andersen’s moral seems quite grim by comparison. However, if one were to really look at the morals presented in each of these interpretations, one would find that the roles in this particular story are reversed. Andersen presents the more realistic message: one cannot achieve true acceptance by falsifying one’s genuine identity. No matter how much suffering and sacrifice one undergoes, there is no real reward in fundamental change. Disney’s version portrays a more censored moral: one is able to achieve true happiness and acceptance by undergoing extreme change for the one they love. Through minor sacrifice and patience during said change, eventually they will gain the love and respect of those they changed for. While Andersen’s moral seems more negative and dark than Disney’s, the truth and realism behind it make it a much more valuable lesson than Disney’s. The moral presented in The Little Mermaid is deceptively false and packaged as morally positive despite its true nature. 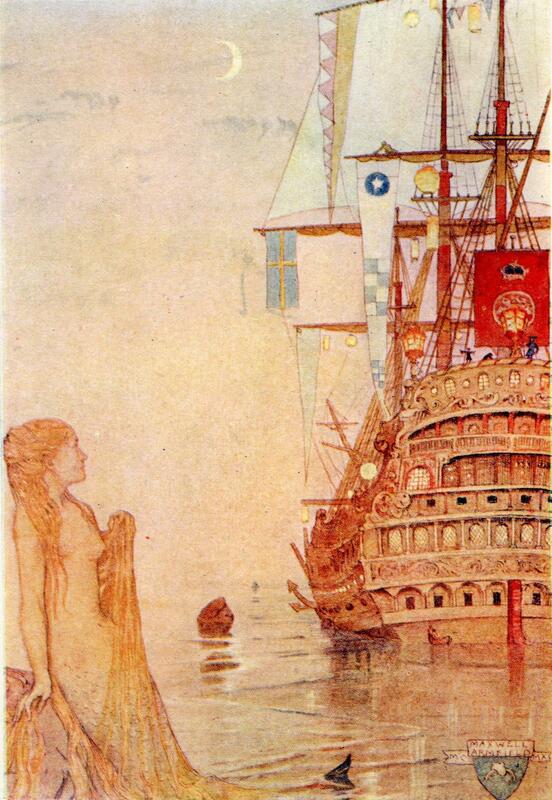 The Mermaid in Andersen’s tale is a sexualized, symbolic figure of female sacrifice, following the desire of her heart and making choices which suit her want for love and human form. Flouting social conventions of the sea, she makes a decision to pursue a different life despite the clear risks involved. Ever seductive, mermaids throughout history have proven to have a grip over humans. By delving under the surface and exploring the deeper meanings behind the morals presented in these two interpretations of mermaid’s tales, one gains a greater understanding of the way in which the ethical message of a decades-old tale changes through the process of “Disneyfication.” Upon making this analysis, one is able to determine which moral is more poignant and realistic past face-value. Auerbach, Nina. Woman and the Demon: The Life of a Victorian Myth. Cambridge, MA: Harvard University Press, 1982. Print. Cashdan, Sheldon. The Witch Must Die. New York: Basic Books, 1999. Print. The Little Mermaid. Dir. Ron Clements and John Musker. Perf. Jodi Benson. Disney, 1989. Videocassette. Meyers, Robert W. “The Little Mermaid: Hans Christian Andersenʼs Feminine Identification.” Journal of Applied Psychoanalytic Studies 3.2 (2001): 149-59. Scholars Portal. Web. 13 Oct. 2011. Mortensen, Finn. “The Little Mermaid: Icon and Disneyfication.” Scandinavian Studies 80 (2008): 437-54. ProQuest. Web. 13 Oct. 2011. Triste, Roberta. “Disney’s Sub/version of Andersen’s The Little Mermaid.” Journal of Popular Film & Television (1991): 145. ProQuest Library Search. Web. 15 Oct. 2011. Waugh, Arthur. “The Folklore of the Merfolk.” Folklore 71.2 (1960): 73-84. JSTOR Arts and Sciences 3. Web. 15 Oct. 2011.